Over 200 EISX managed switches were used on a wind farm in Inner Mongolia to facilitate communication between Goldwind turbines and a central control room. Experts expect China's total installed capacity for wind power generation to reach 20 GW by the end of 2010, with Inner Mongolia supplying approximately 40% of that capacity. Contemporary Controls has several years of experience working with the wind power industry in Inner Mongolia, with successful applications on projects in the Dafeng Mountains, Shaobai Mountains and Dabai Mountains. For this latest project, each wind turbine consisted of the converter system, water-cooling system, pitch system, a 1.5MW wind-power generator set and a tower. The control cabinet of each wind generator set is located at the bottom of the tower and is equipped with a PLC (programmable logic controller), inverter power source, HMI and I/O devices. At the top of the tower, there are several sensors to detect the wind speed, wind direction and shaft rotation speed. A fiber optic Profibus link connects the sensors at the top with the equipment at the bottom. By detecting the wind direction, the control system can adjust the motor yaw gear to maximize the electricity generation. The HMI at the bottom of the tower is used to display the status of the wind turbine. All wind turbines are connected to an optical-fiber ring network with a Contemporary Controls managed Ethernet switch in each turbine. There are several fiber rings and if an individual ring is broken at any one point, communication is not impacted due to the redundant path inherent to a ring topology. 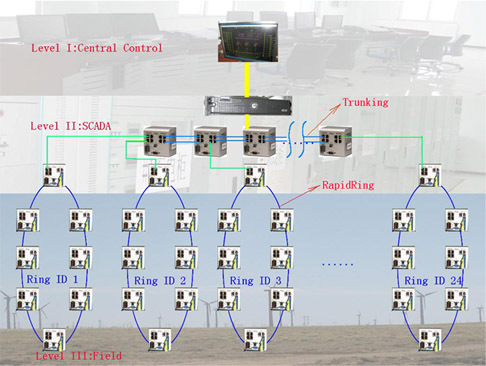 Each optical-fiber ring network is connected to the central control room used to perform remote monitoring and control, analyze the collected data, adjust the setting of turbines and provide intelligent alarms to inform the operators and maintenance staff. Network communication can be divided into two segments: control communication inside the wind turbine, and communication between the wind turbine and the central control room. Below	is	a diagram of the network. Looking at the network diagram, level III shows several rings of managed Ethernet switches. One of the switches in each ring is located in the central control room while all others in the ring are each located in a wind turbine. Level II is dedicated to Supervisory Control and Data Acquisition (SCADA) system. Because each managed switch supports the Simple Network Management Protocol (SNMP), Management Information Base (MIB) data from each switch is available to the SCADA system. Some of the switches in level II are connected together using a trunking arrangement. With trunking you can achieve double the throughput with protection against a single cable fault. Level I shows the main operator interface that can access any turbine within the wind farm. Situated in an outdoor environment, all the controls and Ethernet equipment must be able to tolerate extreme temperatures, lightning strikes, sandstorms and potential electrical interference from high power turbines. Because the job site is extremely remote, the reliability of the equipment is critical. Contemporary Controls' EISX compact managed Ethernet switch met the demanded environmental requirements with its outdoor temperature rating, EMI resistance and enhanced EMC compliance. The unit is extremely compact, providing six 10/100 Mbps copper ports and two single-mode fiber ports. It has RapidRing® fiber ring redundancy that can support multiple rings. As a managed switch, it supports the SNMP protocol. With over 40 years of experience in electronics design, development and manufacturing, Contemporary Controls has become a major supplier to Goldwind, China's leading wind turbine manufacturer. The compact, reliable EISX8M plays an important role in China's renewable energy program. Visit the EISX8M product page to learn more about the EISX8M.